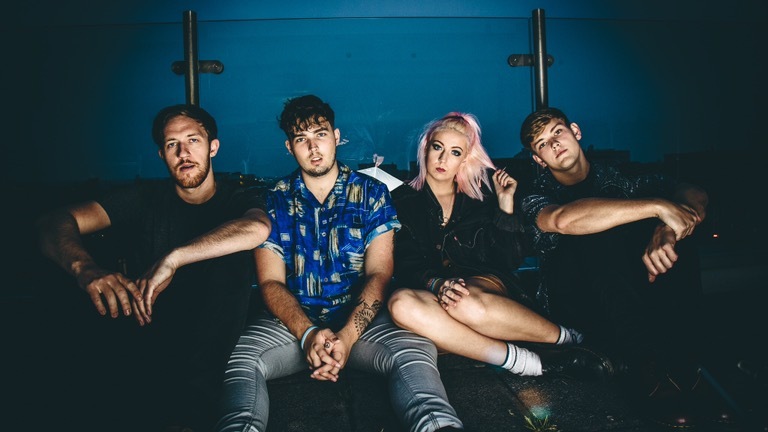 Chester-based indie rockers, Idle Frets, have just released a new single entitled “Glow.” Since forming in 2015, this UK quartet has become known for their cool vocals and anthemic indie rock sound. The band is comprised of members Ben (guitar, vocals), Dave (guitar), Luke (bass), and Erin (drums). Their new track was released on December 9th and has us excited for 2017. Learn more about the band and their future plans from the responses below. Don’t forget to check out “Glow”! What is the story/meaning behind the name, Idle Frets? Erin: We always find it hard to answer this one! Our old bassist’s dad found the phrase somewhere and thought it sounded cool so we went with it! But after that we found a way of it fitting it to us haha! In high school Ben asked us to do a one off gig as mates for a party a family friend needed a band for, and we never knew we would carry on being a band, like an idle threat. Something you don’t follow through with things, and threat changed to fret for a guitar, so we tend to say both those reasons! Luke: Everyone in the band has various influences from D’Angelo, to The 1975, to Biffy Clyro. Having said that we don’t particularly try to be like any other band, we just write music we enjoy listening to and have fun playing live. Ben: Any spare time is all about relaxing, we get so busy so it’s usually pretty precious! Usually just chill out, have a jam or spend time with my dog, because he’s a lad. Ben: We are all quite good eaters to be fair. So if I had to pick I’d say Erin. Only because she’s not the best with spicy food. At all! Dave: We practice 3 – 4 times a week in our studio religiously. Unless we’re hungover – then it all goes out the window. Ben: The writing process varies from song to song but generally I will write the basic song, as in the chords and lyrics and then I’ll take it to the band and we will work on it until it sounds like us rather than just me in my room on my own. Can you talk about the inspiration behind your single, “Glow”? Ben: Glow is about a girl I was proper into. But she was in a time where she had a fella but the writings were on the wall kind of thing and I thought that something was going to blossom between us and then they decided to try and make things work with each other so we had to stop what seemed like a good thing. That’s the general idea but we like people to take their own picture from it so I won’t go into anymore detail. Luke: I’d say that our new material packs more of a punch. A lot more detail has gone into our work and I think we’ve managed to produce a sound that whilst not too far away from the tracks we’ve previously released, there’s an element of freshness with what we’ve got up our sleeves. Luke: We have been writing a lot and have loads more tunes waiting in the flanks. 2017 is gonna be a BIG year. We have so much planned for you already but all shall be revealed in good time. Erin: We don’t tend to any more but used to all the time, most bands start out with a covers set or at least a few covers in there! We used to love playing classic indie tunes like Arctic Monkeys or Courteeners, they made it into a set or two back in the day. Saying that we recently did an acoustic session for Whistle Stop Sessions on a boat and we covered Alicia Keys; it went down a storm so that occasionally pops up if a set needs beefing out! Erin: Depends where we are to be honest. Most of the time we have to pack the kit away jump in the car and drive home or to the next stop because we can’t afford swanky hotels yet! If were sticking around we like to have a few bev’s together and with people who have come to watch us, little boogie, nothing majorly rock n roll I’m afraid! What has been one of your biggest challenges as an emerging band? Ben: I’d say the biggest challenge as a group is time management. We ALWAYS leave things last minute. Dave: Our first ever big festival was a funny one, it was LIMF festival at Sefton park. We turned up late, had no idea where to go or where to park, we all panicked and ended up running miles across this massive park with all our amps and drums, it was chaos! We made it literally just in time for our set, thankfully. Ben: Interesting fact is that Luke has a very interesting song called Hey Luke. It’s a banger, I’m sure at some stage we will pull it out as a special performance at a gig sometime. Some artists or bands we should check out? Dave: The new Childish Gambino record is great. Also loving Clean Cut Kid, Noname and Declan McKenna recently. What can we expect from Idle Frets in the coming months? Erin: I don’t exactly know what I’m allowed to tell you to be honest, but were busy at Frets HQ writing new tunes recording that cliché band stuff, and I know we have a fair few gigs to announce because that’s our main love in all this! So keeps your eyes peeled people, we may be near you soon! This entry was posted in Interviews, Uncategorized and tagged Glow, idle frets, idle frets band, idle frets music, Indie, indie rock, interview, new music, pop, UK, UK band. Bookmark the permalink.